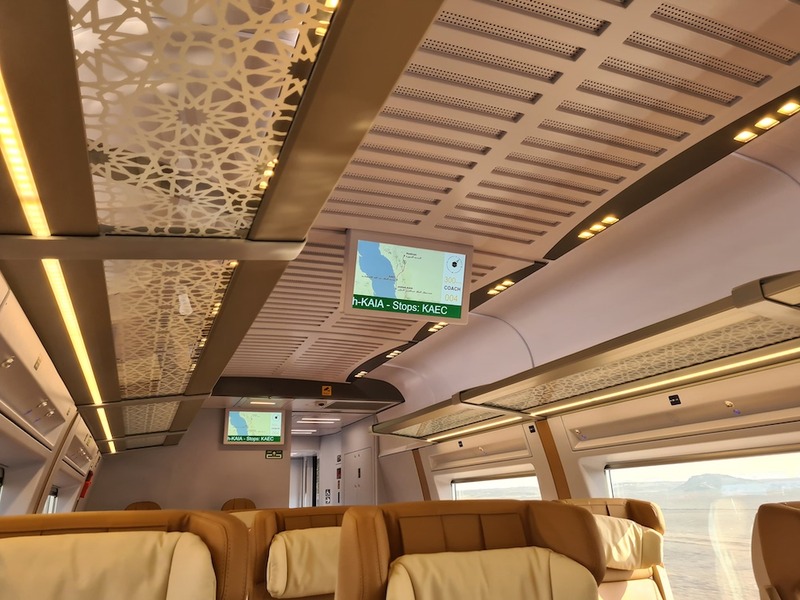 The new high-speed Haramain train is on. Here is how to use the train from Makkah to Medinah and vice versa and other general information before you board! First I have to say I am super excited because train travel is my actual favourite way to explore a country. There are few options for you to get from Makkah to Medinah for Umrah and we cover all of them extensively here. Now that the train is added this is a much safer and faster way of reaching the Holly cities. 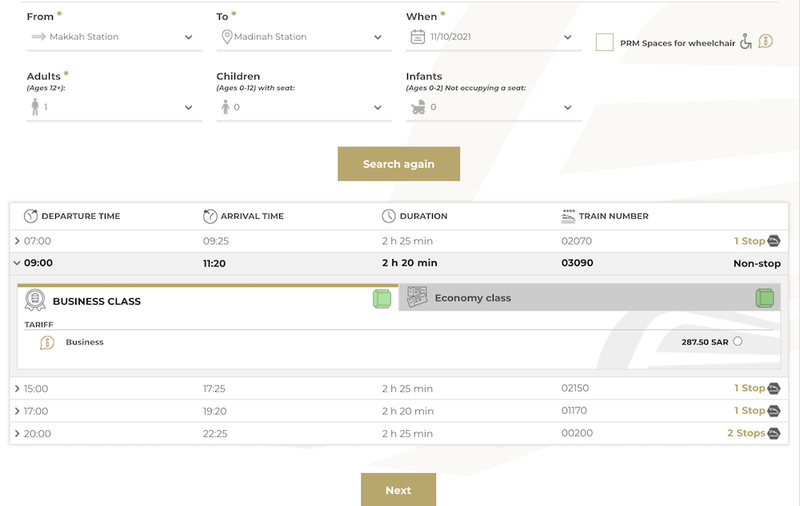 The Haramain train website is here and you can book your tickets for the trains online. Note that after several attempts you can only book a few days out rather than for example a month in advance. There were several seats available even two days before the departure date so there should be no problem. I do hope they will add a bigger calendar option when they start operating in full capacity and speed. Currently, the train doesn’t operate in full capacity or speed. The achievable speed is about 300km/h but at the moment it is around 200km/h. The train takes 3 hours from Makkah to Medinah. 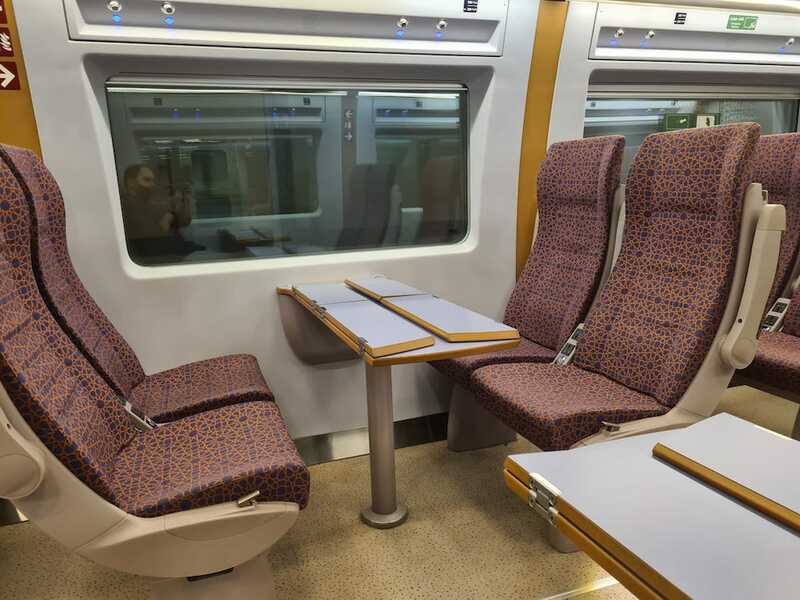 The classes and seats are comfortable and it’s new and clean. In my books, these points totally win. The price of the ticket is not cheap by Saudi standards but by European standards, it is a good value considering the benefits of comfort, speed and safety you have. A one-way ticket in economy costs £35 / 160 SAR per person and children pay half price. A one-way ticket in business costs £55 / 263 SAR per person and children pay half price. For a family of 5 this can add up and I can see the benefit of taking a taxi over spending nearly double the price of a train ticket. Makkah to Madinah train schedule is available below, there are 4 trains per day. The Medinah to Makkah train schedule is below and there are also 4 trains per day. Here are the rules of the ticket and how long in advance you have to be at the train station. Please note that if you go during rush hour depending on the location of your hotel you might need extra time. Also if you don’t have a ticket take this into account as well. Overall you can go to the train for about one hour or 30 minutes before the train departs. Where are the stations located in Makkah and Medina? 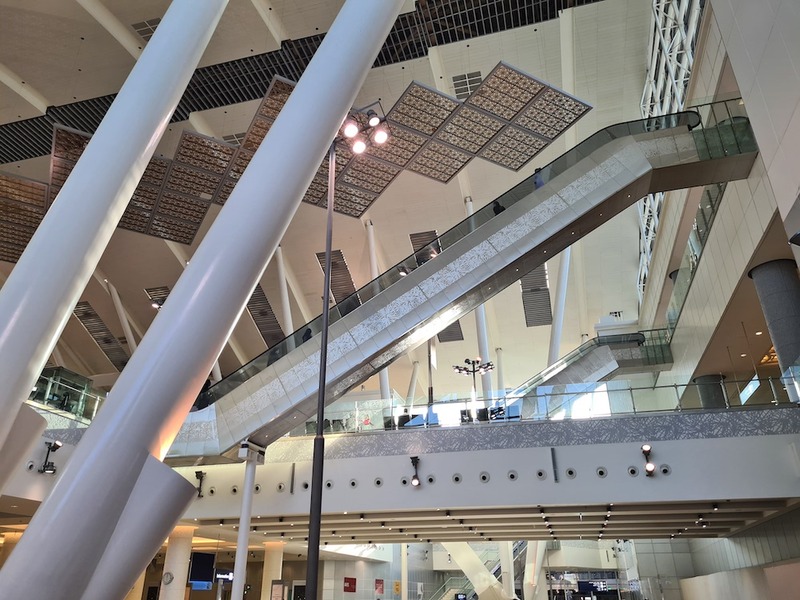 The Makkah Haramain Highspeed train station is located about 10-minute taxi drive from the Haram. You can find the Makkah train station details here. The Medinah Haramain train station is located about 10 minutes from Masjid Al Nabawi as well. You can find the google map location for the Medinah train here. I like the fact that they are centrally located stations so it doesn’t cost a lot in a taxi to reach your destination. 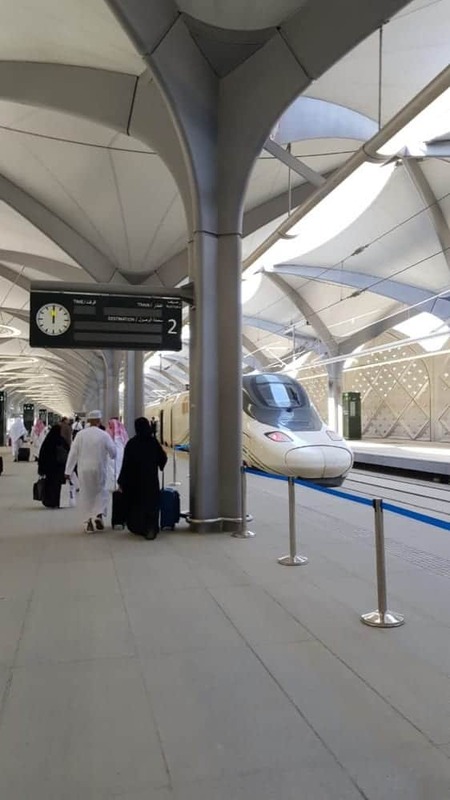 The Train is a service from Makkah to Medinah but it is not a direct link, it makes 1 or 2 stops depending on your train to Jeddah Central train station and to King Abdullah Economic city before arriving in Makkah or Medinah. In total even with the stops, it takes 3 hours to reach the cities which is great. Also please note that there is no link to Jeddah airport so you cannot take the train to go to Makkah. Your option when arriving for Umrah at Jeddah airport is still taking a taxi to Makkah. Otherwise, you have to take a taxi to Jeddah train station and then the train which will cost more and it’s not as time effective. 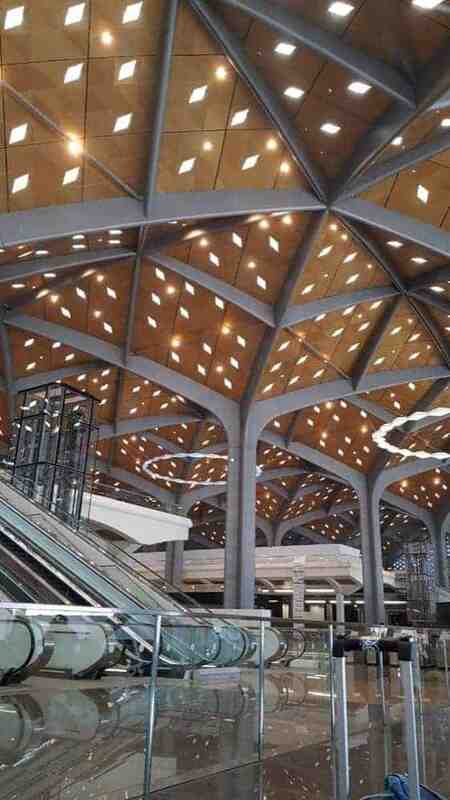 The Haramain train stations do look impressive and you can see a lot of work has gone into this service which has the potential to transform how pilgrims travel from Makkah to Medinah. The Haramain high-speed train is the safest, fasted and most secure way to travel from Makkah to Medinah. At the moment if you want to visit the Holly cities you can take a taxi which can be dangerous with exhausted drivers on the motorway and there are many traffic accidents. Personally, I don’t like taking taxis as I have seen some crazy driving. The other option will be the SAPTCO bus which is also cheap but takes about 5 hours to get to Medinah from Makkah. We have an article on this here. In my opinion, the train from Makkah to Medinah for Umrah is a real contender and it does go with the Saudi vision for 2030 and having 30million pilgrims per year. It is a great way to go for Umrah and be in comfort, especially with young children. My best advice and the fastest option I can see for this is if you do an open jaw flight where you arrive in either Medinah or Jeddah and then fly from the other city. This way you only need a one way ticket on the Haramain train from Makkah to Medinah or vise versa. The link to book the train tickets does not load. I am opening it in Canada. Is there an issue with the link you posted? Hey, I also live in Qatar. As you are aware of, due to diplomatic crisis, we are unable to perform umrah from here directly. Is there any way to perform umrah from Qatar without going to your home country? Do you know of any reliable tour operator in Oman, Kuwait, or in London who will arrange the umrah visa and sell a tour package to a resident of Qatar? Salams please find the post that explains it all. You can find it on the link above. Is it easier to go to Saptco Coach station with kids in Makkah to go Madina or the train station? Jazakumullah khair sister for your informative blog. Im sure lots of people benefited from it, including myself. May Allah reward you and your family without bounds, ameen. JazakaAllah khair for your kind words, it means a lot! We are InnShallah going to Saudi in April. We have first few days in Madinah and next few days in Makkah. Since we are four people, Bus would be more economical for us. I was wondering if bus makes a stop before reaching Makkah for ihram? Yes, the bus stops so you can change in ihram. Salaam, is the rail still running as I heard there was a recent derailment. I tried to book for the end of April and even with flexible dates it would not give me any ticket options. Salams, the train is working but if you read above you can only book for a day or two in advance. So booking for April won’t provide you with any option. Salams the notes on the ticket indicates up to 10 min before the train leaves. Of course, this depends on the time of travel if it is peak season I would go about 1hr to 30mmin before the train especially if you have bought your ticket. Also, note that if you go after Friday prayers the time for taxis to get there will increase. After daily checking the booking site.. alhamdulillah managed to book 2 economy tickets from Makkah to Madinah on the 21/04/2019. The only thing worrying me is the luggage although me and son have 1 suitcase each and will be under 25kgs but the dimension not exactly the required size.. that’s not going to be a end of world issue for the staff ther will it? Personally, I would try to stick as close to the dimensions as possible. It really depends on who will be on duty and their mood, they dont pull measure tapes. I assume that if it fits on a plane it will fit on the train. But obviously don’t take a massive suitcase that is too much beyond the measurements, its never a good idea either on trains or planes. Also, make sure it is within the weight limits as well. A few cms +/- should be ok.
How much luggage were you allowed to take with you on the train please sister? AND a smaller hand luggage one (like cabin luggage on a plane) ? Personally, I would try to stick as close to the dimensions as possible. It really depends on who will be on duty and their mood. I assume that if it fits on a plane it will fit on the train. But obviously don’t take a massive suitcase that is too much beyond the measurements, its never a good idea either on trains or planes. Also, make sure it is within the weight limits as well. A few cms +/- should be ok.
Jazakallah for your response – we will be trying to travel as light as possible! the train website is slightly confusing as it says suitcase and handbag – but can the handbag be a cabin sized suitcase? Is all the luggage stored in the overhead racks in the train? Cabin luggage should be ok.
1)How much Madinah railway station to masjid nabawi taxi fare? Or If Bus Service much Ticket fare ? where Bus drop. Salams please read above regarding the luggage. Also, we have rules. As general one suitcase and one hand luggage are ok. I am not sure regarding the taxi fare. Please check uber for an approximate fare. We have a guide on transportation above as well. By any chance… Do you know about the miqat for umrah. Salams, I am actually not sure. However they should, also it’s only 3 hours and I know a lot of people wear their Ihram from their Medina hotel. Dear Adam, if you take SAPTCO bus it will stop in miqat (Bir Ali) for around 30-45 minutes. Normally it will be good to take shower and use your ihram from your hotel. Indeed if a coach is an option for you and you really want to wear your Ihram then. salam, glad to see guidence and response.May god bless you. Please read the article above to see the link and book. If you’ve two suitcases, do you’ve to purchase two tickets on the train since they’re only allowing 1 suitcase on a ticket?